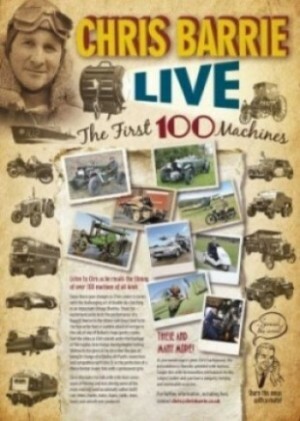 Listen to Chris as he recalls the filming of over 100 machines of all kinds. Enjoy those gear changes as Chris comes to terms with the challending art of double de-clutching in an important vintage Bentley. Share his excitement as he tests the performance of a Bugatti Veyron in the Alsace rush hour! And taste the fear as he faces a sudden attack of vertigo in the cab of one of Belfast’s huge gantry cranes. Feel the vibes as Chris stands under the fuselage of the mighty Avro Vulcan during engine testing. Wallow in the glory as he describes the joys of being in charge of a Gresley A4 Pacific steam loco and sympathise with him (!) as the perfection of a Manx Norton leaves him with a permanent grin. Chris illustrates his talk with stills from seven years of filming and test driving some of the most exciting (and occasionally rather dull!) cars, bikes, trucks, trains, buses, tanks, locos, boats and aircraft ever produced. As you would expect given Chris’ background, the presentation is liberally sprinkled with humour. Couple this with his boundless enthusiasm for the subject matter and you have a uniquely riveting and unmissable occasion. For further information, including fees, contact Chris via the contact form now.